Next Monday in the United States, we’ll be celebrating Memorial Day. For many children and families, it can simply mean a day off of school and work. But it can also be so much more than that. It’s a perfect time to introduce ideas and concepts to your kids that they might not have considered before. It’s a time when you can experience special moments with members of your own family who have served in a war, or lived through a period of war. 1. Watch a war movie together as a family. Of course, you’ll want to determine what your kids are mature enough to handle, but here are some suggestions: The Red Badge of Courage, Shindler’s List, The Pianist, and Saving Private Ryan. 2. Bring books, movie, or cookies to your local VA hospital. Many of these veterans may be in the hospital for awhile and might not have families to bring them new things to look at or watch. If your kids have special talents such as recording their own music or making art, this might be a good time to see if they’d like to create something of their own to share. 3. Remember a family member or friend who fought in a war and has died. If you live near where they are buried, you can visit their grave. Go through old pictures and/or videos. Remember what they liked to do. 4. Read aloud some war poems. Illyria is a great site to find very moving poems about all aspects of war. 5. Remember the personal battles your family has fought over the past few years. You might work together to make a list of things such as illnesses, financial trials or emotional difficulties. Remember those things that helped you through those times. 6. Play a collection of Patriotic music throughout the day. Here are some suggestions of music you can download – The Ultimate Patriotic Music Collection, Songs of the Civil War, and In Country: Folk Songs of Americans in the Vietnam War. 7. Visit the closest battle site where you live. 8. View a chart of war statistics. Go to findthedata.org and compare and contrast wars going back to the 1700s. 9. Create a slideshow presentation using images of war. Your kids can choose those things that interest them such as military weapons, fashion during a certain period of war, battlefields or famous generals. 10. Listen to sounds recorded during wars. BBC School Radio has a very moving and sobering collection of sounds from wars including air raids and bombings. 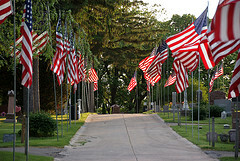 Do you have any important Memorial Day traditions in your family?